Let me first apologize for irregular updates. I hope I will be able to make some more nail designs soon and write more often. So to the nails topic… This time I made nails with dazzling hexagons. 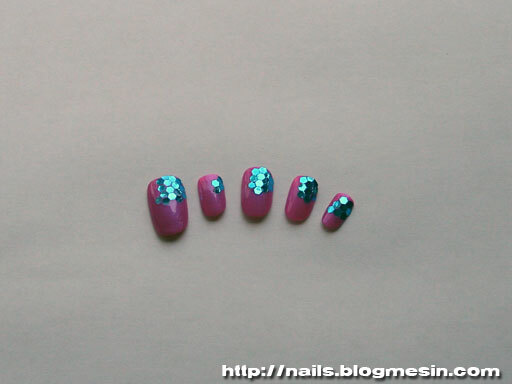 They are kind of really big glitter and are great both for artificial and natural nails. They look really good embedded in gel because they give a feeling of a depth in the design. The advantage of using them on natural nails is that they are very thin and enough flexible to be applied straight on wet nail polish. The design I made takes only couple of seconds longer than normal nail polish application. I put hexagons straight on wet nail polish organising them in irregular shapes and then applied two layers of top gloss. If some hexagons will stick out outside the nail edge you can cut them with small nail scissors or file them out with mild nail file. I used fuchsia nail polish with a violet glow so I thought that blue hexagons will fit good here. In sunlight or stronger artificial light this hexagons shine so bright that the nails look like a discoball. Hello Shweta! Thank you for your comment :)I would love to post some video tutorials, but I cannot do it yet 🙁 I hope one day I will be able to do it!